Let your customers open new tickets with just one click from their EDD account screen. Optionally validate license keys. 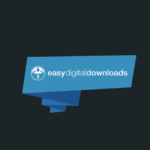 The Easy Digital Downloads add-on adds support for both EDD, the Software Licensing add-on and the Frontend Submission add-on. When using this add-on, your EDD clients will automatically be granted permissions to submit support tickets. To make it easy for your clients to get help about one of their purchases, they can open a ticket directly from their purchase history. 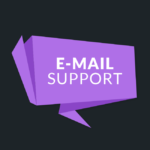 Clicking “Get Help” will lead them to a pre-filled submission form where they just have to tell you about their problem, select a product and a license key from a dropdown list (if you use the Software Licensing addon). The Software Licensing integration adds two extra fields to the ticket submission form prompting for the order number and the product license. The product license is verified upon submission and a ticket can only be submitted with a valid and active license key. On the admin side of things, the ticket details screen will give you useful insight on the ticket and the purchase. You’ll be able to see the purchase details right away. If your shop has a time-based refund policy, which is quite often the case, you can set the number of days after which the purchase can be refunded. A visual indication will then tell you if the purchase is still in the “refund period”. 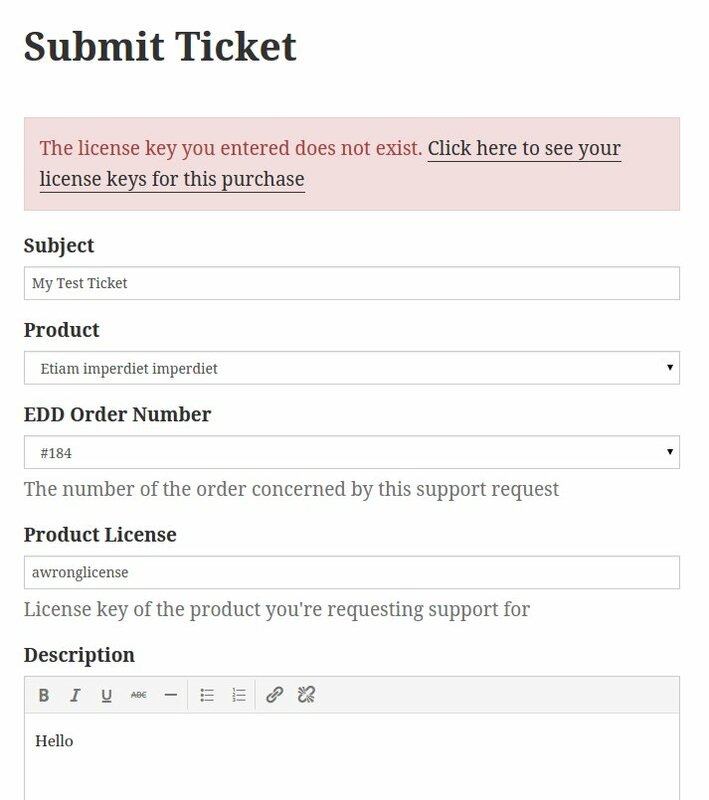 Also, if your clients request help through the EDD purchase history page, the ticket submission form will be pre-filled with the order number and only the appropriate license keys will be displayed. 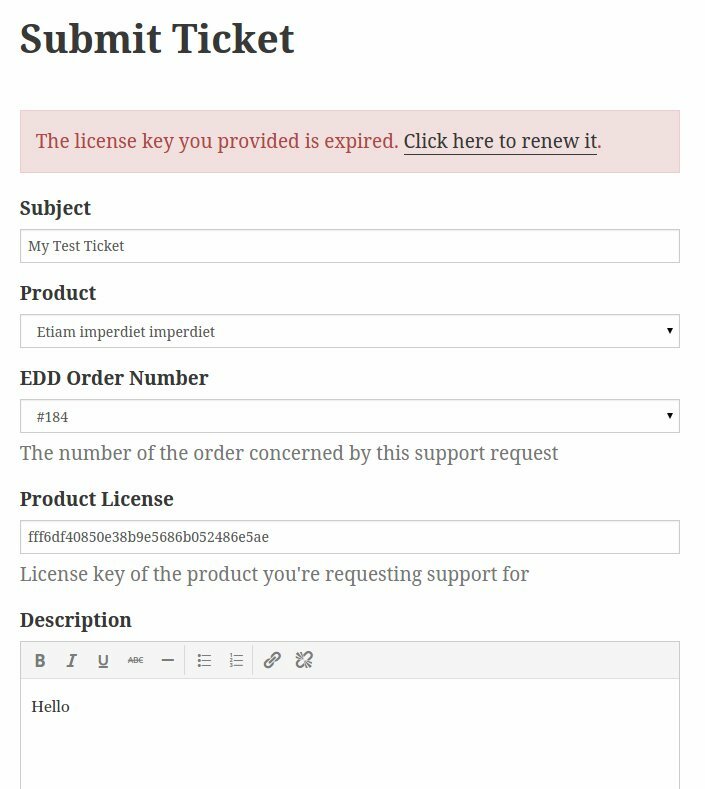 With the Frontend Submission integration, your vendors will be able to manage support tickets without the need of a separate agent user account. Even better, you can decide, for each vendor, if incoming tickets related to a vendor product should be assigned to this vendor automatically. Control which license states are allowed to submit tickets – active, inactive, expired or any combination of the three. 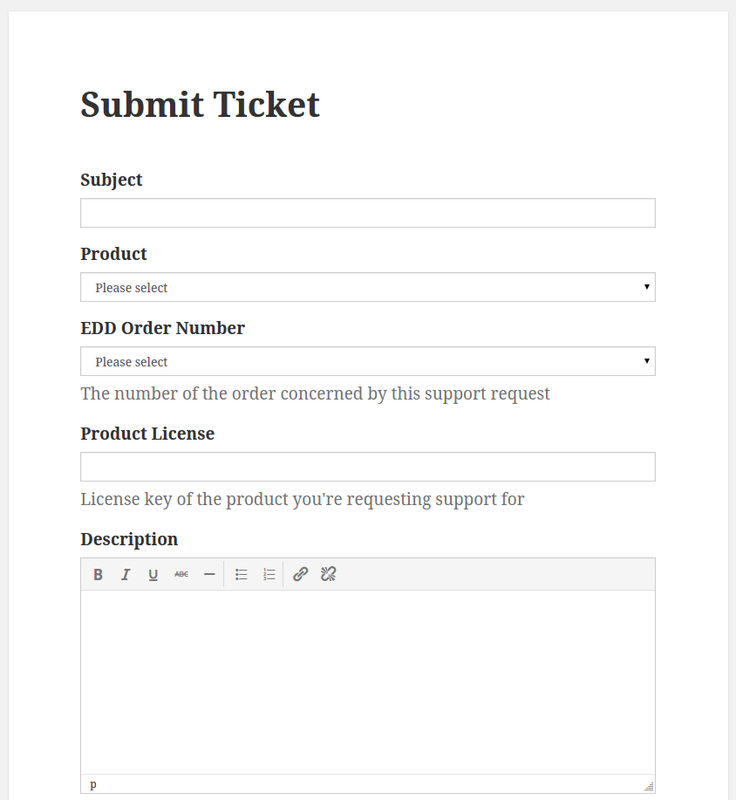 Change the label text for the order number and license fields on the ticket entry form. 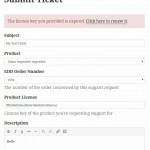 Change the description text for the order number and license fields on the ticket entry form. 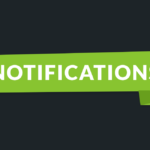 Fix: Latest version of software licensing now includes a new status - 'site_inactive' that needs to be handled. 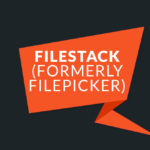 Fix: Allow certain options to be blog specific when running on multi-site. Warning: Please test this new version in your development/staging environment before moving into production. There were some breaking changes as described below. 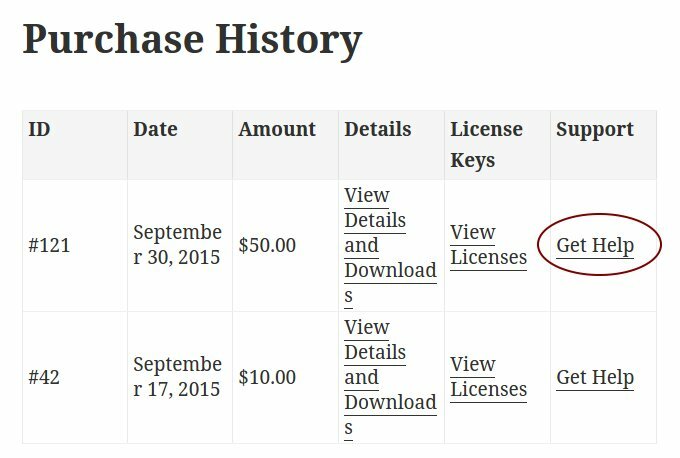 Enh: When software licensing is in use, added the license status next to the license key in the license key dropdown. 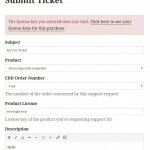 Enh: Selecting a product on the ticket page will automatically restrict the ORDER NUMBER and LICENSE drop-down to values that contain that product. 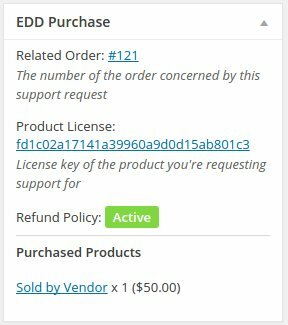 Enh: Added option for admin to change titles and description of edd order number and description fields. Fix: Refund policy was not being displayed correctly - it always showed as expired. 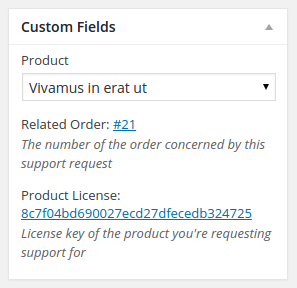 Dev: Added new debug option in TICKETS->SETTINGS to show/not show the term ids and post ids used in the license dropdown field. Version number skipped - no public release.